"Allison Sekemoto once struggled with the question: human or monster? 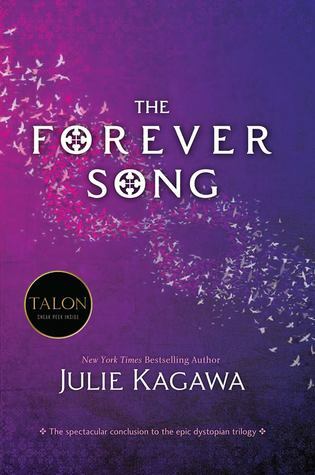 In an exciting conclusion to an action packed series, The Forever Song brings our crew out of their shells and reveals their true morality and determination. This book shows how Allison deals with her depression by no longer fighting off her inner monster and no longer caring for human life, which of course gets Jackal’s approval and Kanin’s disappointment. Her attention then draws to a past memory of herself when she was younger and she finally finds a way to accept her depression and grief. She resolves to never give into the Monster again. Our crew once again, finds themselves traveling throughout the land. This time they must hurry to get back to Eden and stop Sarren from destroying any rabidism cures and spreading his new Red Lung disease that kills both humans and vampires alike. Although traveling in stories can be tedious, the author perked it up by adding different obstacles and challenges along the way, of both emotional and physical nature. It’s when they get to Old Chicago to find out about a new vampire Raider King that things get crazy. I absolutely loved this scene and (although it’s hinted at, at the end of The Eternity Cure,) I found it interesting in how Allison took control of her emotions, and continued to hold on to some type of hope in this situation. Zeke once told Allison not to hesitate to go through him to kill Sarren, but after everything she’s gone through can she follow through? Can Sarren ever truly be defeated, or is it too late to stop the spread of his destruction? Can they find a cure for this horrific disease, or have they had it all along? The Forever Song will bring you to tears of both happy and sad. This is a beautifully done series ender, and if you liked the first two books, you’ll fall madly in love with this conclusion.